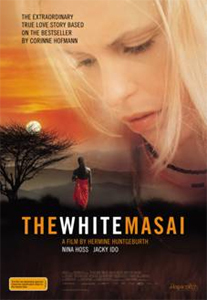 The film The White Masai is at once a captivating romance and a breath-taking travelogue into the Kenyan outback. It follows a woman named Carola from Switzerland that falls in love while on vacation in Kenya. Based on the autobiography of Corinne Hofmann, one of the most popular books in Europe of the past decade, it tells the unbelievable - yet true - fish-out-of-water tale of a white European woman who becomes the wife of a Masai warrior. The exotic urban jungle of Mombasa - where the two first fall in love - and the tiny village surrounded by majestic landscapes where they make their home provide a backdrop that is nothing short of extraordinary.